It seems like I have been doing repairs this summer more than building. 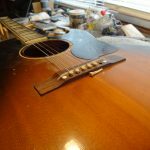 I got a guitar in to repair last week from Rod, who fixes my car when needed. Unlike most of the guitars I work on, this is a steel string from the early 1950’s. It was Rod’s mom’s guitar. He said she used to play it and sing. It is a Gibson CF-100. 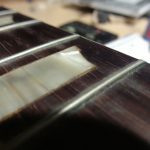 It was in unplayable condition: strings were loose, the bridge pins were gnarly and corroded, and it was full of dust. But from the outside, it looked like there was no structural damage. 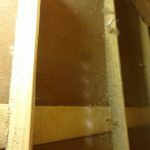 Rod said he would like to have it be playable again. The CF-100 is a sweet little guitar in some ways. It has a body about the same size as a classical. Scale length is 24 3/4″ or about 330mm. The sunburst finish is nice enough. Construction however… another matter. I won’t detail the compromises. I don’t think anybody would do that today. First inspection disclosed that two of the four back braces had separated from the back. One had a crack. (Actually, all four had separated.) Back braces that separate from the back will vibrate and rattle when the guitar is played, so they had to be fixed. It is not (i’m tempted to say “ain’t”) easy to reach those braces, but I’m resourceful…. 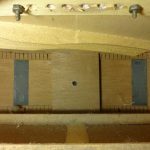 The inlays on the fingerboard were loose, (not falling out, but spongey and proud of the fingerboard) they needed regluing. 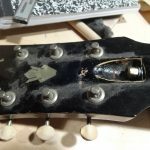 The truss rod needed adjusting. The pegs were deformed, the saddle was made out of a strange plastic material that was quite worn (maybe usable). At first I thought the tuning machines needed replacement, but they do work. After I vacuumed the guitar I realized that there was a very recognizable perfume to it. I wonder if Rod will recognize it. 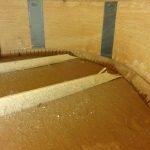 I post more about the guitar and repairs… for now here are some pictures. 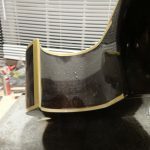 This entry was posted in workshop and tagged braces, bridge, cf 100, gibson, glue, Repair and restore. Bookmark the permalink.